The drive toward higher system performance. Rapidly increasing system modularity, which in turn creates a need for subsystem health monitoring. Historically, designers implemented system protection by monitoring temperatures at key locations around a system. And while temperature is the greatest indicator of system health status, unfortunately it is also a lagging indicator. An increase in system temperature is normally caused by increased current flow. By measuring and modeling the current draw of a system, designers can manage thermals more efficiently and anticipate and proactively address problems. Using precision temperature and current monitoring together enables systems to achieve higher levels of reliability and performance. The amount of current flow in a system greatly impacts its reliability. 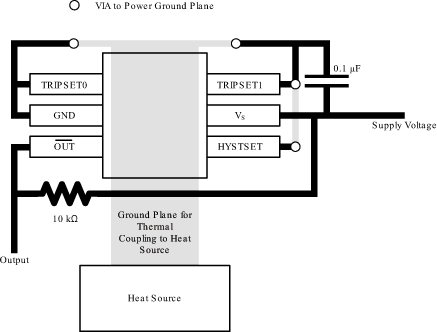 An increase in current correspondingly increases an integrated circuit’s (IC) junction temperature. 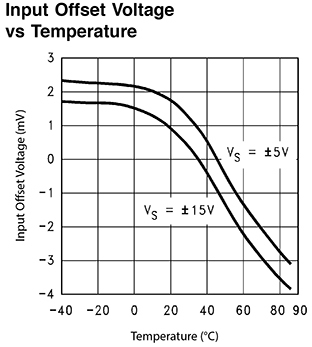 And increasing junction temperatures can negatively impact performance such as IC voltage offset or gain errors (Figure 1). In extreme cases, junction temperatures can exceed the maximum operating conditions, permanently damaging the IC and causing system failure. Another type of system fault would be a short to power or ground, accompanied by a rapid change in current. Therefore, it is critical to detect faults as early as possible to prevent system-level damage. Characterizing a system to understand its current load profile can provide valuable insight into areas of concern. Enabling distributed-current monitoring instead of a single-system current also narrows down the list of potential issues more quickly. Download TI's overcurrent event detection circuit example. To help address this need of precision current monitoring, TI has introduced the INA301 and INA381 device families. Both devices offer an overcurrent alert function as well as a voltage output capability for measuring the absolute current level (Figure 2). This combination of outputs provides flexibility to actively monitor current only when it has exceeded a predetermined early warning threshold, which is highlighted by the alert pin. The INA381 has the added benefit of being available in a 2mm-by-2mm ultra quad flat no-lead (UQFN) package. Monitoring load currents can help maximize system performance. Let’s look at a telecommunications central office scenario where minimizing power consumption is critical. Monitoring the load current for each line card in a large communication system platform makes it possible to balance both power consumption and performance. During off-peak times, enabling only a single line card minimizes system power consumption. But if you monitor the current being consumed by the communications processor, you can detect when the load (or number of users) is increasing and bring additional line cards online. Even with design strategies to proactively manage load currents, there will always be a need to have overtemperature protection, as it is the last line of defense before overheating and system failure. One of the most popular components for thermal system protection is the TMP302, which provides intuitive overtemperature detection in the form of a very small, accurate and low-power temperature switch. See Figure 3. TI’s latest devices enable you to monitor both the load current and temperature of a system while consuming very little board space, giving you critical insight into both a leading indicator as well as an absolute understanding of a system’s thermal profile. 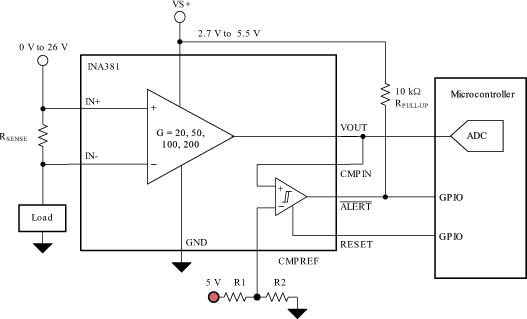 Design a unidirectional current sensing solution with this overcurrent event detection circuit example. Learn more about TI’s current sense amplifiers. Check out TI’s temperature sensors.